BDP, with Kier Education, has been selected as preferred bidder to design The Wellington Academy near Tidworth in Wiltshire, named after Wellington College which is its sponsor. The design of the academy, for Wiltshire County Council, responds to the rural site with the plan arrangement loosely paralleling the house system in use at the college. The school will cater for 1,150 students ranging from 11 to 18 in age. The plan is organised to create sense and order while providing a wide variety of spaces for formal, informal and serendipitous learning. It also features a community ‘front door’ displaying the specialisms of the school. The central heartspace links to four ‘commons’ acting as gateways to the thematic or subject areas of performing arts, business & enterprise, science and design & technology. The design responds to microclimate and maximises natural ventilation and sustainable timber construction to form the central hub space. 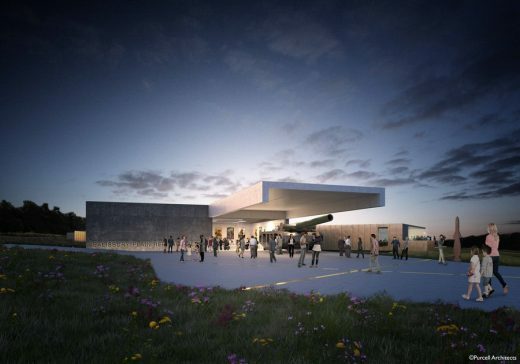 The design will provide for a 350 seat theatre which is part of the performing arts cluster which, together with business & enterprise, is placed to the front, while science and design & technology radiate from the back, overlooking the stunning views of Salisbury plain. A facility for the combined cadet force and a separate boarding house for 100 pupils with social, infirmary and house parent facilities are also provided on the site nestled into existing woodland. Keith Papa, BDP Project Director, said: “We are delighted and looking forward enormously to working with everyone involved with the project. The sponsor had a very clear vision and was excited by the idea of setting learning areas around a hub space where the business & enterprise specialism will be showcased. It is also a very beautiful site and we are very keen to create strong connections with the surrounding landscape.